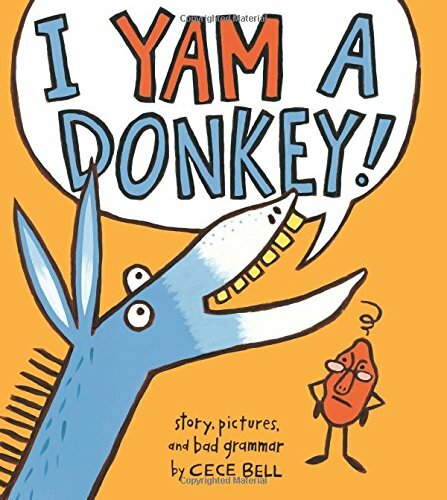 Literary Hoots: I Yam A Donkey! Downright hilarious. While technically, this book is a picture book, it's a book that will be lots of fun for everyone of all ages. It's nice for beginning readers because it's repetitive in the text, and has a nice lesson in grammar—but it might not be as funny. Honestly, those that are going to have the most fun with this book are those that can appreciate proper grammar (though it might get the true Grammar Nazi's cringing). The illustrations are simple (the fact that the yam is wearing glasses just adds to the humor) and the text is simple, but the lesson its teaching is more complex. In the end, I imagine I would have a lot of fun reading it to grade-school kids or sharing it with my friends. I don't think it'd work in, say, preschool storytime. But honestly, read it—in a lighthearted way. Cece Bell has an amazing sense of humor. A good readalike would be Who's on First?—yep, as in Abbott & Costello.